Exit the Florida Turnpike at exit 152 and go north on Kings Highway. Approximately 1 mile from the exit, turn west on Pruitt Research Center Rd. 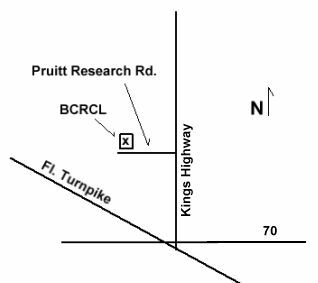 The gate to the Hayslip Biological Control Research and Containment Laboratory (BCRCL) is about 0.4 mile from Kings Highway on the right side of the road.